The Chevrolet Camaro ZL1 is already an impressive piece of work, but the ZL1 LE is now here and it’s about to take things to an even higher level. Nice. YouTube spotters statesidesupercars have managed to capture footage of the Camaro ZL1 LE out at the Nurburgring as it attempts to best the ZL1’s time of 7 minutes and 29.6 seconds. We’re fairly certain it happened. This video looks like it’s Chevy’s official Ring lap attempt, so if there’s good news we wouldn’t be surprised to hear about it in the coming days or weeks. 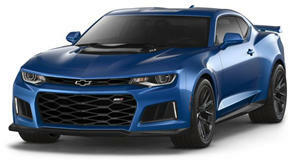 Like the Camaro ZL1, the ZL1 LE is powered by a supercharged 6.2-liter V8 with 650 hp and 650 lb-ft of torque. But the ZL1 LE adds even more aerodynamics to better help it break through air. And remember, the ZL1 LE doesn’t come with the ZL1’s 10-speed automatic, but rather a good old conventional three-pedal six-speed manual. With a 0-62 mph time of 3.4 seconds and a top speed of 195 mph, the ZL1 LE is currently the ultimate, most badass Camaro you’ll soon be able to purchase. And what better way to kick off sales than to tell customers about its Nurburgring dominance? Like we said, we’re just waiting for that official Chevy press release to come in any day now.